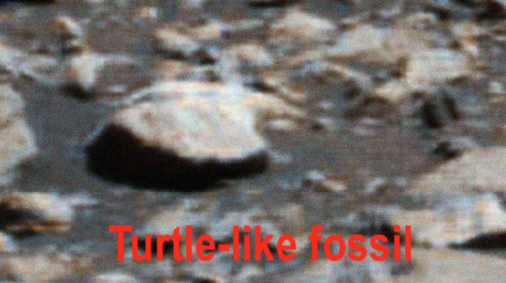 I found a turtle-like fossil of of a creature in a Mars surface photo today. The object shows lots of signs of once being an animal. The shell has a back bone area from front to back. It also has ribbed sides that are slightly raised as turtles have. One end looks like its where the head came out because its raised up allowing an open area. The opposite side has a tail like sharp area…which is part of the shell. Instead of a soft tail as turtles have here on earth, this has a hard tail that is built into the shell itself. I also found a few faces, pipes and a fallen statue…notice on the statue its wearing a turban like hat that drapes down over its shoulders…also on the center of the turbine hat is a round ornament. Previous Post:UFO Clouds Over Iceland During Sunset Instills Comfort, Nov 2018, UFO Sighting News.